“Socio-fiction” was exhibited at the Institute for Contemporary Art (ICA) in Sofia between December 1st 2015 and January 9th 2016. 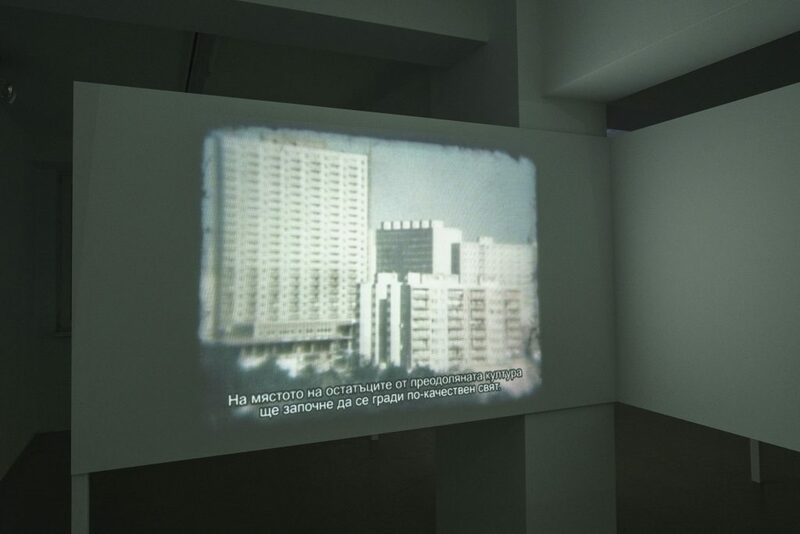 The name of the show was borrowed from the title of one of the four video-installations by Czech artist Zbyněk Baladrán, which were presented in the framework of his solo exhibition. It was itself the outcome of a co-operation between the Czech Institute in Sofia and ICA as well as of the collaboration of curators Edith Jeřábková and Yara Boubnova. 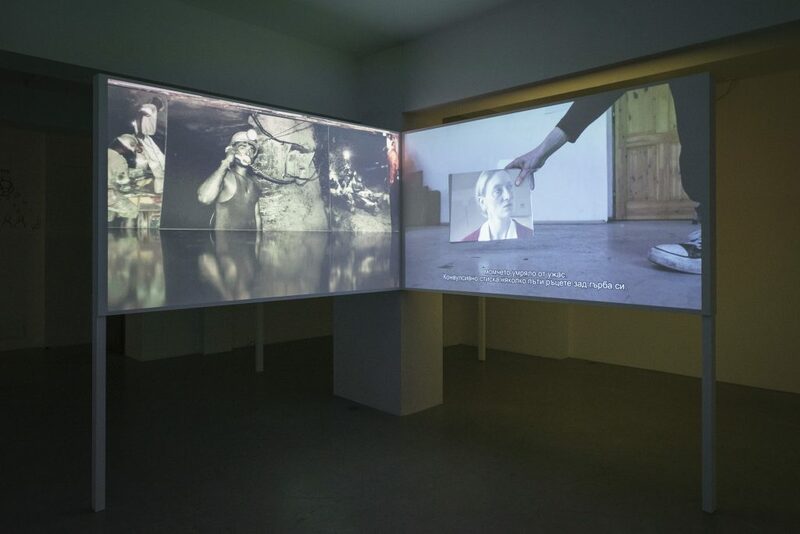 Upon entering the space, the visitor is immediately faced with the necessity of “choosing a side” between the enclosures of the first two installations – Socio-fiction (2005) and Night of the World (2011), themselves separated by the frames of their projection screens. The construction of the whole exhibition is in fact very simple: the screens of the four installations conjoin so as to form a straight angle at the central column of the space. They thus create a kind of cross through whose “compartments” the visitor has to pass consecutively. Each of the spaces’ enclosures, created by the intersection of the straight lines, generates a different situation of watching and listening: at times the sound comes from headphones that you have to put on in order to “enter” the video, at times it dominates the whole space of the exhibition – as in the case of Socio-fiction. Thus the sound plays an important role in modulating the sense of intimacy to each of the works as well as in constructing a distinct way of keeping time within the exhibition as a whole. The structure of the exhibition and the mode of organisation of each of the works at first strike as strictly formal. It seems that they not only act within constrained frames, but also deliberately configure new grids upon the already established ones. To give an example: the way in which the four installations forming a cross are positioned within the relatively small exhibition hall already imposes a particular choreography upon the movement through this space; if visitors wanted to “pass” through all the works, they would have to move either clock- or counter clockwise. Also, while the possibility of initial choice of direction is indeed present, it nevertheless seems that the video Night of the World is the logical point of departure for the parcour. It is the shortest amongst the exhibited works and the only one whose beginning one can easily discern when walking in at any given moment. Thus, one could speculate that it acts as a kind of time synchroniser, while simultaneously conceptually and thematically opening the exhibition towards the question of what is yet to come and that which precedes it: “I write because I like the moment of creation. You have nothing, and the next moment suddenly something. An unexpected, unforeseeable moment.” The black screen, the darkness on whose plane voice and subtitles resound, is the actual topic of the 2-minute piece: “The film begins with darkness.” Darkness, with which both the structuralist film (the empty field) as well as Deleuze’s philosophy of cinema (the interval) preoccupy themselves: here it has literally invaded the screen and set in motion the question of that which is impending, of the image’s potential as well as its reverse side. Refusing to offer us any images save in the form of subtitles, the video inhabits the intermediary space between film and literature. 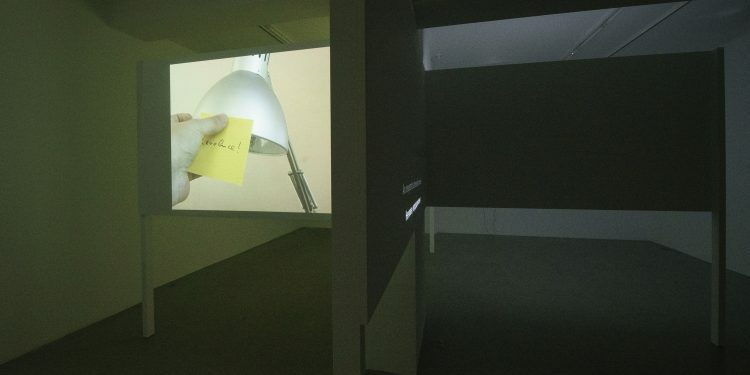 Similarly to the script, about which Baladrán writes in the catalogue that followed his 2011 exhibition The Nervous System in collaboration with Jiří Kovanda, this installation is also opened towards both, without “being” neither film nor literature. Influenced by the 1964 text by Pier Paolo Pasolini ‘The Screenplay as a “Structure that Wants to be Another Structure”‘ (1986), Baladrán formulates his interest precisely in respect to the hybridity of the script as a form. The question of the borders and the mutual exposure of different forms, genres and medias towards each other continues to play an important role on the territory of his show in Sofia. Interestingly enough, the exhibition itself becomes a research method, through which those questions take shape. If to some extent Night of the World has been deprived of its status as a filmic work, but has been left to pulsate on the threshold between film and literature, darkness and light, it nevertheless bestows on the experience of the whole exhibition a filmic character. The alternation of image-interval-image; the direction of movement, forced upon the viewer; the double loop within which one finds herself (on the territory of both the video work Night of the World as well as Socio-fiction as an exhibition taken as a whole); the centrality of montage as a means of artistic organisation – all these elements contribute to the filmic character of the time spent with the exhibition. If we come back to the question of the interval’s potential and the “openness” of film and literature towards each other, but also towards other ideas, forms and genres, then we can also attempt to interrogate the exhibition itself from this perspective. My specific interest is consequently the possibility of examining how the fictive territory of this specific exhibition organises itself and operates and how a set of fictional characters, historical events and discursive elements become narrativised and imbued with a political charge. The always already political problem posed in Deleuze’s opus about the relationship between becoming and territory, or becoming and frame, gains concrete artistic and practical dimensions in Baladrán’s work. The question which permeates all the installations and ties them together conceptually, is about the relationship between reality and fiction and the extent of the latter’s political potential. Due to the author’s preoccupation with methodology and its importance for artistic practice, it appears that his search commences with the laying bare of the tools and methods, which would allow for the extraction of this potential. This is also why Baladrán’s interest concentrates on how different discourses and forms of writing construct their subjects (characters) and tell their stories. All of the exhibited video works engage deliberately with those internal procedures, about which Foucault (1981) writes that the discourse applies in order exercise control upon itself: the commentary, the author and the discipline. Each of them is explored and unfolded differently in the different video works. Baladrán’s approach appears rather Deleuzian, though, as the focus in each instance is put on the question of how, by departing from those forms and procedures, one can procure their opening and deterritorialisation. In all of the brief examinations it is thus not about a strict “application” of some predetermined set of means of expression – be them derived from psychoanalysis (Preliminary report/Case study), the report (Approximation of infinite sequences) or the educational film (Socio-fiction). They are, instead – to put it in Baladrán’s words – always polluted and put in relation to other forms of writing and story-telling. Installation shot by Kalin Serapionov. All rights reserved. Source: ICA-Sofia. Preliminary report/Case study (2013) is the only two-channel and perhaps the most complex installation in the exhibition. 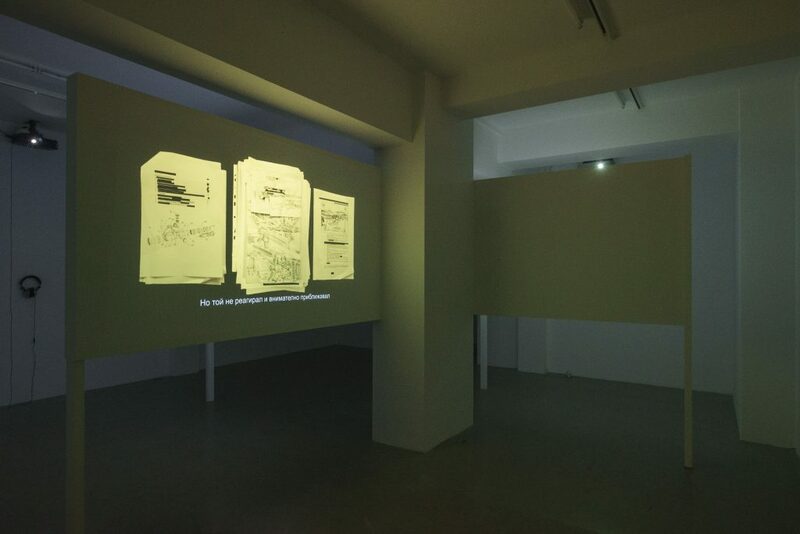 It consists of an audio-montage of early texts by Sigmund Freud and Joseph Breuer on hysteria, themselves overlaid with videos which occupy the space on the two screens either in sequence or simultaneously. In the left projection one can see a hand superimposing photographic images that all represent different conditions of labour, predominantly in mines. The right screen offers a series of images on which the mimics of a middle-aged woman freeze in a sequence of different expressive poses. Here again the media conditions which enable the emergence of the image are brought to the fore – the projection either appears on a piece of paper held by hand or expands upon the whole screen. Thus, even if the occurrences on both screens remain divergent and create a dissonance in the viewer, they are still formally tied to each other. Together, they pose the problem of the material and discursive preconditions for the stories and images unfolding on and through them. The work makes apparent at least three different forms of representation of information, of showing and exhibiting; its specific combination at first makes the piece appear quite didactic. However, it simultaneously creates an intensive sensorial overload and forces the viewer into splitting her attention. She is left with the sense that something has “been lost” and is forced to look twice and listen again. Her attention is also directed at the productivity of those singular forms of representation – each of them stops being transparent and taken for granted, but rather becomes the topic of the work itself. Thus the psychoanalytic language is denaturalised, while the way in which it reads different symptoms and describes the body of the patient gains a fictional character. Deprived of any claim of neutrality, it nevertheless defines the way in which the patient herself, when she comes to speak, talks about herself. Albeit fragmented, in this autobiographical narrative events follow each other chronologically and insist upon the reality of experience: “This really happened, it wasn’t a dream.” Here the video work abandons the search for the authentic (traumatic) event and instead poses the question of what comes out of the encounter between psychoanalysis and (its) subject. Furthermore, this discursive productivity is provokingly formulated in the statement that the traumatic event creates continuity. There is not hysteria without psychoanalysis. Which is not to say that the psychoanalytical discourse about hysteria doesn’t engender reality producing effects – including a narrative continuity and the coherence of the character who articulates it. In Approximation of infinite sequences (2015) a female voice reads out excerpts from various documents: reports, testimonies, protocols and instructions, organised around an accident which played itself out on a working platform at an unidentified site. An unknown intruder trespasses the site’s frontiers and is subsequently shot by the security forces operating on the platform. The autopsy, however, reveals not a human, but an abnormal anatomy of the creature: instead of brain, the skull contains something similar to a spinal cord. At the same time the creature has altogether three lungs amongst which the conductor of the autopsy finds “something [he] didn’t like the look of”. As with Preliminary report/Case study, here again the montage acts as a driving force behind the narrative, but in this case it is the alternation of quotations from different formal documents which constructs it. The active presence of the reader who is repeatedly confronted with more and more frequent “illegible” fragments, suggests a further narrative level. We can only guess what has provoked her interest towards the documentation, how she has gained access to it, to whom and why is she reading it out loud and what her position towards the incident might be. – the latter is uttered with such a disappointment and resignation, that the sense of a yet untold story, running in parallel to the one of the eliminated trespasser, is enhanced even further. An additional impression makes itself felt: that the reader embodies the future of the story, whose fragments she attempts to match together – an activity whose logic is also taken up by the projected animations. Photocopied instruction books, reports and protocols with a different amount of “illegibles” are being ordered, rearranged and exhibited on the screen. If we were to rephrase an utterance from the last piece in the exhibition, Socio-fiction: these dispersed documents represent the horizon, on whose backdrop the reader gathers the traces of her present and possible future. Both, however, remain impenetrable for the viewer. The reader’s final sigh as well as the question of what the coordinates and driving forces of this indiscernible future might be are in the end left to her imagination. Indeed, one of the central subjects of Socio-fiction is the problem of the relationship between past and future. 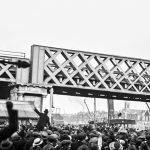 Here, their imagining is once and for all posed as a political issue, as a problem of the revolution: “every responsibility is revolutionary because it attempts to do the impossible”. A revolution cannot be planned – continues the voice of yet another reader – as it always surpasses any possible horizon. The central element of this work is Marx and Engel’s Communist Manifesto and the question of what significance it might still have today. What does it constitute, if not one of those horizons that need to be reinvented? By posing the question about the necessary conditions for change, the film responds relatively unequivocally: destruction – one of whose forms is forgetting – presents itself as a condition of change. But destruction of what and forgetting of whom or what? The video also brings together several fragments whose interrelation offers a new interpretation of history: it presents itself as that which cannot be erased with a single gesture, precisely because it is built up by a multitude of quivering, uneven and nonaligned minor stories. Socio-fiction narrates the story of Czech architect Karl Honzík, in whose conception a utopian, classless society is not only possible, but also realisable on other planets with different evolutionary trajectories. It is indeed predestined that every thinking creature should at some time arrive at Marxism. The interesting thing about this work is that the reading of this and other stories – as the one of the failed attempt to blow up the radio station “Radio Free Europe” – are neither subjected to irony, nor have they been subsumed under the common denominator of one big failed “project”. Such attempts to tell stories differently gain an explicitly political charge on a yet another level in the post-communist contexts of the Czech Republic or, say, Bulgaria. 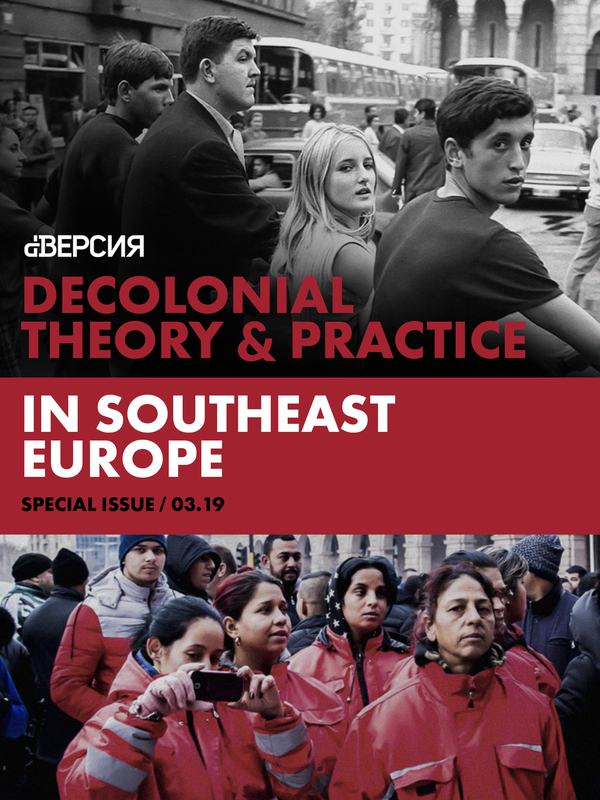 In a country such as Bulgaria to lay a claim on the communist past and its seemingly buried artifacts like the Manifesto is all too often deemed a reactionary act by voices from the self-proclaimed political and intellectual elite. This is why “polluting” the memory of the past with diverging versions of it offers a way out of a consensual understanding of the present and its relation to other times. In Socio-fiction Baladrán rejects the convenient position of an arbiter over the right kind of (hi)story but rather sets forth to craft a vocabulary and imagery which would assist him in posing anew the problem of revolutionary change. 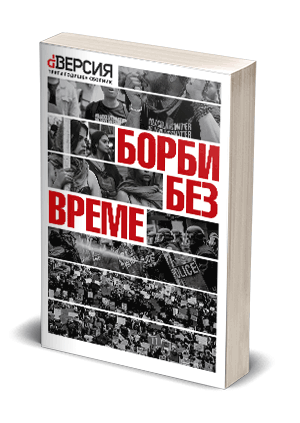 An altogether different text would be needed to demonstrate why the question of the revolution seems not only improbable but also an up front foreclosed one in Bulgaria’s post-communist context of neoliberal austerity measures that exert their own pressure on the future. 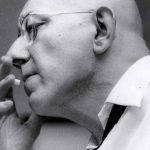 Perhaps the pretext of artistic practice and the necessity to think with an artistic work that it brings upon visitors, readers and viewers, can offer an alternative route for the introduction of questions that are otherwise all too often swept away from other public spheres like media or education. It creates an, if limited, space and time where it still appears possible to earnestly consider the Communist Manifesto as a problem of the present and the future. 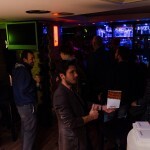 Baladrán, Z. and Kovanda, J. (2013) The Nervous System. Zürich/Milano: JRP Ringier/Kunstverein Milano. Foucault, M. (1981) “The Order of Discourse”, In: Young, R. (ed.) Untying the Text. A Post-Structuralist Reader. Routledge & Kegan Paul: Boston, London & Henley, p. 56. Pasolini, P. P. (1986) The Screenplay as a “Structure that Wants to be Another Structure”. The American Journal of Semiotics. 4 (1/2). p. 53-72. Zbyněk Baladrán. (2015). Approximation of Infinite Sequences . [Online Video]. 20 October 2015. Available from: https://vimeo.com/142978892. [Accessed: 10 August 2016]. Zbyněk Baladrán. (2011). Night of the World. [Online Video]. 29 May 2011. Available from: https://vimeo.com/24388069. [Accessed: 10 August 2016]. Zbyněk Baladrán. (2013). Preliminary Report / Case Study. [Online Video]. 30 April 2013. Available from: https://vimeo.com/65141453. [Accessed: 10 August 2016]. Zbyněk Baladrán. (2005). Socio-fiction. [Online Video]. 19 September 2009. Available from: https://vimeo.com/7683124. [Accessed: 10 August 2016].